A Vega rocket delivered two satellites to orbit at 9:58 p.m. EDT on Aug. 1 (01:58 GMT Aug. 2), 2017, from the European Space Agency’s (ESA’s) Vega launch complex in Kourou, French Guiana. This was the 10th flight of the small, solid-fueled launch vehicle, which included improvements in its payload fairing and launch pad design. 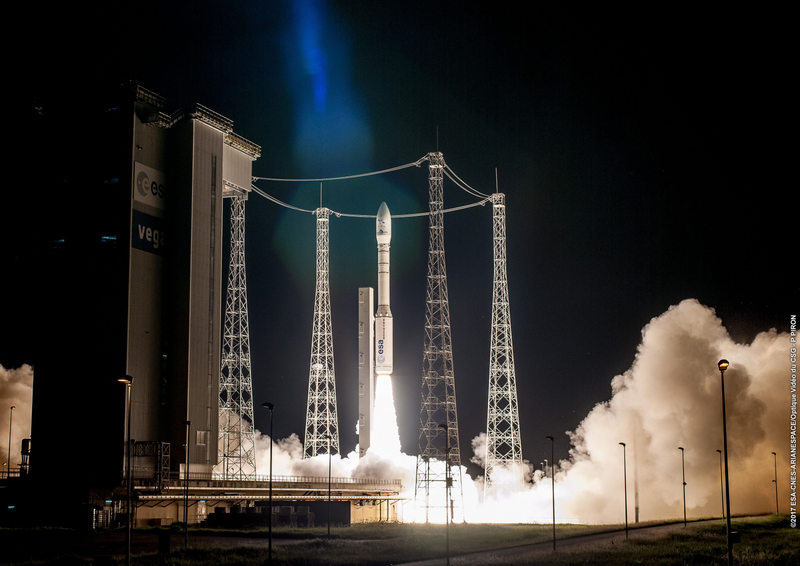 The payload of the launch, designated VV10, included the Optsat-3000 imaging satellite for the Italian government, and the Venμs environmental monitoring satellite, a joint project between the French and Israeli government. Both were placed into Sun-synchronous orbits. 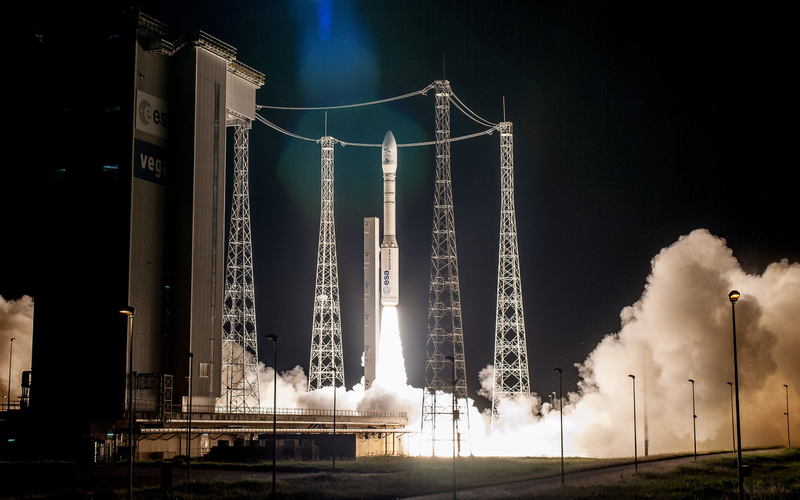 “With this second Vega launch of 2017, and its 10th success in a row since being introduced at the Guiana Space Center, Arianespace is very proud to support two major Earth observation programs for Italy, Israel and France,” said Arianespace CEO Stephane Israel in a news release after the two satellites were deployed. For this mission, ESA announced two modifications to the 98-foot (30-meter) tall Vega vehicle and its launch pad. The new payload fairing is lighter and cheaper than the previous version and is made entirely from composite materials. Pad infrastructure was also modified to reduce acoustic vibrations during liftoff. Vega includes a three-stage, solid-fueled lower section and a liquid-fueled, restartable upper module. The whole mission, from launch to final satellite deployment, lasted 97 minutes and included five firings of the Attitude and Vernier Upper Module, also called AVUM. The 811-pound (368-kilogram) Optsat-3000 spacecraft was deposited in a 280-mile (450-kilometer) high polar orbit inclined 97 degrees some 43 minutes after liftoff. It will provide the Italian government with high-resolutions images of Earth. Venμs, which stands for Vegetation and Environmental Monitoring on a new Microsatellite, is a joint project between the French and Israeli governments and will monitor surface vegetation. The microsatellite carries an electric engine for propulsion. It was deployed in a 447-mile (720-kilometer) orbit inclined at 98 degrees. The next Vega launch is not expected to occur before Nov. 7, 2017. It will send a military reconnaissance satellite into space for the government of Morocco. Depending on the gas flow from nozzle at the first stage- no complete oxidation occurs. The optimal burnout takes place outside the nozzle. The propulsion can still be adited.